A simple ladies' brown leather strap watch from designer fashion brand Gucci. 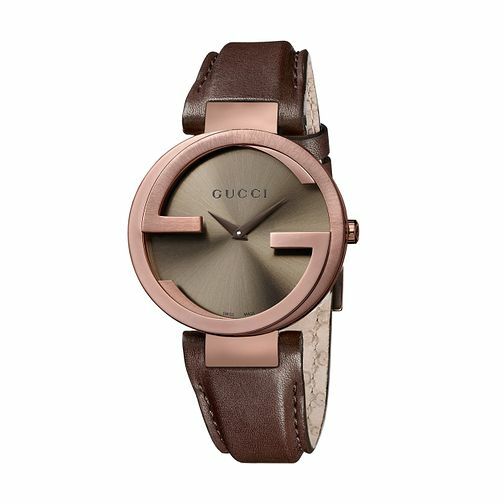 Features a round sun brushed dial framed with Gucci's interlocking G monogram, crafted from sleek brown PVD. A stylish yet versatile timepiece for the modern woman. Size large. Gucci Interlocking G brown strap watch large is rated 5.0 out of 5 by 3. Rated 5 out of 5 by Anonymous from Stylish and Different Got this watch in the sale and it's absolutely lovely. The face is a gorgeous bronze colour and it's really unusual.